What is Electrical Discharge Machining (EDM)? What is a Reference Standard? In the fast-changing Non-Destructive Testing (NDT) industry, Standard Test Blocks serve the very important purpose of standardizing and calibrating test equipment to ensure that it is functioning properly. These blocks are non-representative tools, meaning that they are not manufactured from, or machined to represent, actual parts. Rather, they consist of simplified design and contain manufactured targets such as side-drilled holes, flat bottom holes, angles, radii, steps and other geometric features. Within the discipline of Ultrasonic Testing (UT), Test Blocks allow the technician to calibrate instruments for both angle beam and normal incident (straight beam) inspections. The blocks are used to set metal distance and sensitivity settings, determine the beam exit point and refracted angle of angle beam transducers, evaluate system resolution, and more. For years, standards organizations such as ISO, ASTM, ASME, and AWS have issued codes governing the manufacture of Standard Test Blocks for conventional UT. These blocks perform perfectly for simple pulse-echo systems, but their effectiveness is limited for newer Phased Array Ultrasonic Testing (PAUT) systems that employ multiple elements in a single transducer. Phased array technology is now widespread in the industry, but codes governing the manufacture of calibration blocks for PAUT are surprisingly lacking. As a result, there are many different ways to approach a PAUT calibration. The spacing between targets often increases as well. The more generous spacing helps to eliminate “ghost images” that would otherwise appear from adjacent holes if they were located too close to one another. 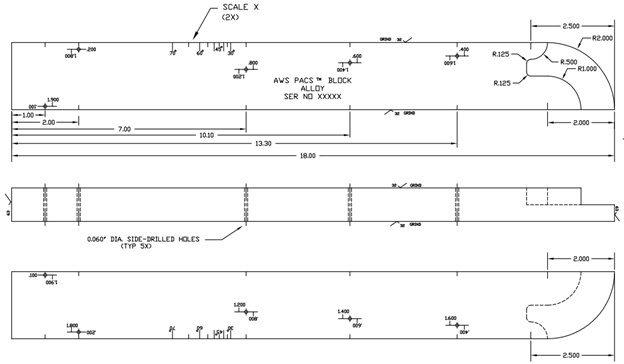 A perfect example of this can be seen in the PACS™ (Phased Array Calibration and Sizing) Block, an innovative design that was jointly developed by PH Tool and Mark Davis of the University of Ultrasonics at the time. Much like a traditional IIW-Type Block, the PACS™ integrates features used in establishing beam exit point, beam angle, metal path calibration, and sensitivity, with the important addition of allowing for angle corrected gain (ACG) in depth and in metal path for phased array equipment. The side-drilled hole reflectors are offset from each other over the 18.000 inch (457.2mm) block length to afford improved access over a wide range of sector angles or long linear scan lengths. The traditional IIW-Type Block is not suited to this function. Curved scanning surfaces to simulate pipe OD or ID. We hope this piece has helped to clarify some of the trends in Phased Array UT block designs. The PACS™ Block is just one of many solutions that PH Tool offers for PAUT applications. 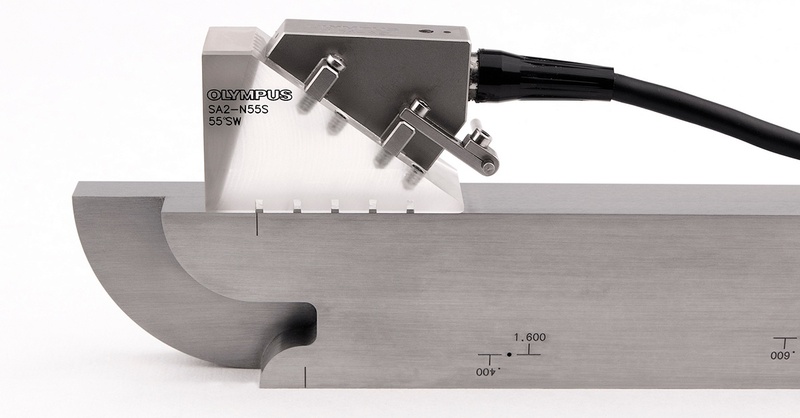 Other examples include the new “PAUT IIW Block” from ISO 19675, other blocks in the PACS™ Family like the Mini PACS™, PACS™ Notch Block, and AWS PACS™ Block, Phased Array NAVSHIPS Block, ASTM E2491 Assessment Block, and PAUT Pipe Calibration Blocks for ASME Sec V requirements. 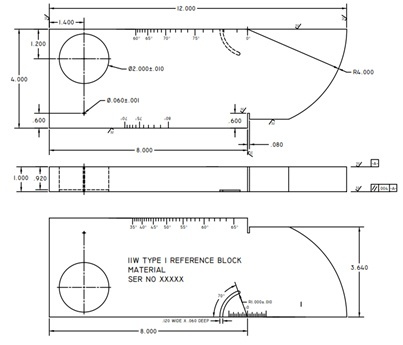 PH Tool will also make custom blocks to meet your exact specifications. Large bar and tubular reference standards can also be made for large-scale inline PAUT inspection systems used in primary metals manufacture. To learn more about test blocks for phased array UT, or to request a quote, please contact PH Tool Technical Sales. For more than 40 years, our team of toolmakers, machinists, and management staff has supplied the NDT industry with high-quality test blocks and reference standards, featuring our EDM notches, flat-bottomed holes, and other "perfect imperfections." We’ve spent decades earning a reputation for supplying our customers with products and services that are second-to-none. We look forward to answering your questions and teaming with you on your next project.